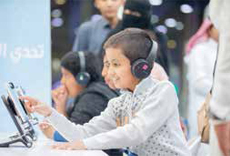 The outdoor Lightning Show was just one of scores of activities hosted by the King Abdulaziz Center for World Culture as part of Sharqiah Season 2019. Sharqiah Season 2019 wrapped up Sunday. The festival — the first of the Kingdom’s 11 scheduled festivals in 2019 — is the biggest cultural event to be held in the Eastern Province, featuring more than 80 events covering culture, education, and sports. 17 days Ithra hosted world-renowned exhibitions, live performances, a film festival, a fitness challenge, and pop-up restaurants. 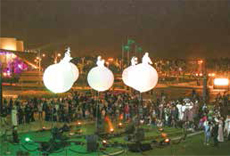 55 countries have hosted Strange Fruit’s Spheres performance, and they have played at over 500 international festivals. “Zamakan: Notions of Time and Space Complexity” — the latest contemporary art exhibition — opened at the Ithra Museum last week, featuring the work of 11 Saudi and Saudi-based artists at its Funoon Gallery. The exhibition, which continues until September, houses 18 pieces of art from both established and up-and-coming artists, including artists from Ithra’s open call for submissions in late 2018. 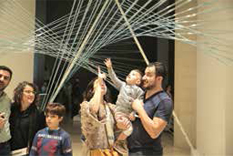 Participating artists include Abdullah Al-Othman, Ahmad Angawi, Ayman Zedani, Aziz Jamal, Dana Awartani, Maha Malluh, Moath Alofi, Muhannad Shono, Omar Abduljawad, Sara Abdu, and Zahra Al-Ghamdi. Alofi’s brother, Abdulmajeed Alofi, said: “Although Moath is my brother, we were not aware of this. He made it a surprise for us. It is a nice surprise and a nice feeling as well, as I used to be an architectural engineer at this Center, and now my brother is showcasing his work here. A Van Gogh interactive exhibition also opened at the Ithra Museum as part of the event. The story of Van Gogh was brought to life in an interactive way through an actor who narrates the story with images projected on the walls. “It is amazing to see Van Gogh here in Saudi Arabia. His story is sad, however, and very influential,” said Joud Courtright. 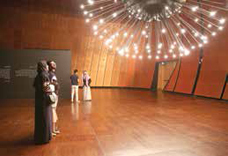 “I am glad Saudis have the opportunity to come and see his work. I am very happy to see his work being recognized. “I love his painting, and my favorite is Starry Night. The strokes of his paintings are amazing. I love to follow his color techniques and painting strokes — it is how I like to paint,” Courtright added. Strange Fruit performed the beautiful Spheres at Ithra. Having performed in 55 countries and at more than 500 international festivals, well over 5 million people have seen the performances. In collaboration with the Saudi Arabian Society of Arts and Culture in Dammam, Ithra also hosted the Fifth Saudi Film Festival. The six-day event brought together producers, directors, script writers, actors, and other members of the local and international film industry to accelerate the development of the nascent Saudi film industry. 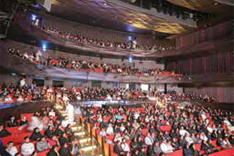 During the week, nominated movies from Saudi and around the Gulf were screened. Four competitions were held, including narrative, documentary, student films, and nonproduced scenario competitions. Last week, the winners were announced, with “The Distance Zero” winning the Golden Palm for Best Narrative Film. “The Cave” won the Golden Palm for Best Documentary Film. “Spoilers” was awarded the Golden Palm for Best Student Film, and “Hattrick” won the Golden Palm for Best Script for a Nonproduced Scenario. Ithra’s Lush Gardens hosted the first Fitness Challenge. 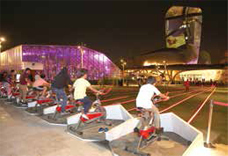 Visitors pedaled stationary bicycles and exercised to produce as much energy as they can. “I think it is a really nice event, because it promotes fitness, and I love challenges,” said Jumana, a Fitness Challenge participant.